One litre of horse sweat contains around 3.5g of sodium, 6g of chloride, 1.2g of potassium and 0.1g of calcium. A horse can easily lose 5 litres of sweat each hour on a normal day at a moderate pace which equates to the loss of around 50g of electrolytes. This amount would not be replaced by the horses’ normal daily hay and hard feed alone. 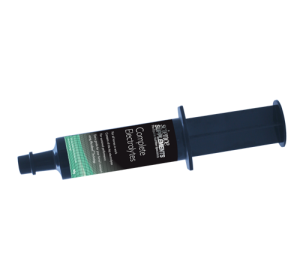 We manufacture two types of electrolytes. 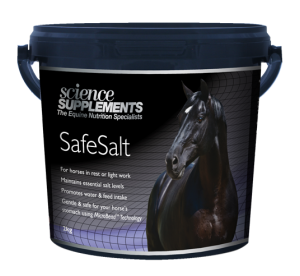 Safe Salt for horses in light work or rest and Complete Electrolytes for horses in work. Our electrolytes are unique. We use a technology called Micro Encapsulation. This means the electrolytes do not dissolve in the stomach but dissolve in the small intestine where electrolyte uptake is optimal, and is both palatable and gentle on the stomach unlike ordinary electrolytes. 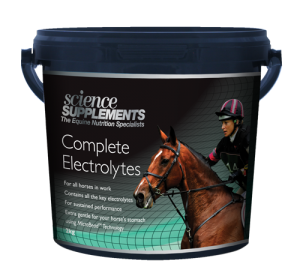 Lack of key electrolytes is a common cause of poor performance and feeding a balanced electrolyte supplement is vital to maintaining peak health. Click on the individual products below for detailed information and feeding guide.